The 7 Future Stars of the Wearables Industry are Announced! Out of 940 submissions the most innovative companies were chosen and awarded at the WT | Wearable Technologies Conference 2018 EUROPE in Munich. Munich, 30th of January – It was a blast! 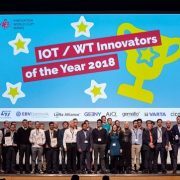 Coming from all over the world, 28 young companies and techpreneurs presented their extremely innovative and groundbreaking products on stage at the pitch and award ceremony of the IOT / WT Innovation World Cup® 2018. AI glasses assisting blind and visually impaired, an intelligent game ball improving your stress level, smart shoes saving the worker´s life, fashion headpieces capturing your brain data, and many more great solutions took the stage. The finalists of the leading open innovation competition for IoT and wearables solutions demonstrated impressively the innovation happening today in the industry. But only seven WT Innovators of the Year 2018 made the race in the four categories ‘Lifestyle’, ‘Sports & Fitness’, ‘Healthcare’, and ‘Industrial’, as well as in the EBV IoT Hero Special Prize, the Geeny Connected Living Challenge and the AIQ Smart Clothing Challenge. Congratulations to all wearable winners IOT / WT Innovation World Cup® 2018! The winning teams are now part of the IOT / WT Innovation World Cup®`s Hall of Fame. http://www.aiqsmartclothing.com/wp-content/uploads/2018/02/wteu18.jpg 362 776 stephanie.lin http://www.aiqsmartclothing.com/wp-content/uploads/2018/01/AiQ-_White-logo_20170630.png stephanie.lin2018-02-12 17:19:002018-02-12 17:19:00The 7 Future Stars of the Wearables Industry are Announced!